Learn more from how-to posts and case studies about email marketing, measuring & testing, analytics, and content strategy – with a little SEO, social media, and productivity thrown in. A template to plan your content, grow your traffic, and save time in the process. Do you want to plan out your content for the next quarter or year? Do you want to identify your content niche for your blog so you’re not starting from scratch each week? Do you want to make sure you have the marketing details (SEO, slug url, post titles etc.) covered for each post? Do you want to grow your blog, business, audience, and authority like a professional? A content plan or strategy helps you produce the right content, for the right people, at the right time. An editorial calendar template gives you a process for producing content on a consistent basis. Get quick, actionable advice on how to use content to grow your business. 7 lessons, delivered to your inbox each day. Strategically plan out your content for the year. Follow my process and get your content ready to grow your business. Download as an Excel workbook or use with [Free] Google Sheets. “Thanks so much for this update! We have used your calendar since 2014 and it’s great! I appreciate the work that goes into this!” -Kelly C.
“Really clear and useful!” -Mary R.
“As a one-person business there are never enough hours in the day and I find myself getting pulled in different directions. I downloaded the Editorial Calendar and have tweaked it to my needs. Thanks for sharing!” – Paula K.
“Thanks it is already helping a great deal.” -Crystal L.
“This is wonderful. Thanks SO much.” -Jessica P.
Before you create an email marketing strategy, there are some things that can make your work a little easier. This post is all about assembling your toolkit — before launching straight into a strategy. 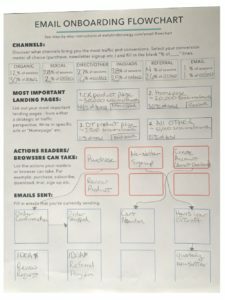 One of the first things I do when working with a new client is to do a communication audit – including creating an email onboarding flowchart. An email onboarding flow chart can also be thought of as an “audit” or review of the emails you’re sending. It’s a look at how people experience your messaging as they first interact with your website. Some refer an onboarding flow chart to a UX role, but in this case we’ll be taking a look at it from on email marketing perspective. Take a look at the example flow chart to the right. This onboarding flow chart takes a look at all the ways Sample Company is currently communicating with their newsletter subscribers through marketing and transactional emails. Why do we use a flow chart? Creating a flowchart, or mind map whether that’s a digital version (or even just sketched out on paper) is one of the best ways to get a quick visual of what’s happening in your messaging. With this flow chart you can see what’s going out based on actions or things your users (readers or customers) are doing. With this structure in place, you can see where there’s room for improvements, changes and testing. To keep confusion to a minimum, start out with your marketing (newsletters etc) and transactional emails. Either make small side notes or create a separate flowchart to include items that have to do with notifications – “signing up”, account changes, password requests etc. Those emails need to be kept track of as well, but for analyzing to create an email marketing strategy, you’ll focus on marketing and transactional emails first. Grab a pen and paper or your favorite mind mapping software and let’s do a quick overview. You could also use a text file, or a spreadsheet, or some kind of fancy software to outline this information. In future steps, you’ll also be digging into Google Analytics and any email marketing reporting you already have if needed. Draw boxes for any automated emails you’re currently sending (order confirmation, welcome email etc.). Use this worksheet to sketch out your onboarding email flowchart, or just go free-hand. Use this step-by-step worksheet to improve your onboarding and sales by sketching out your current traffic and emails. 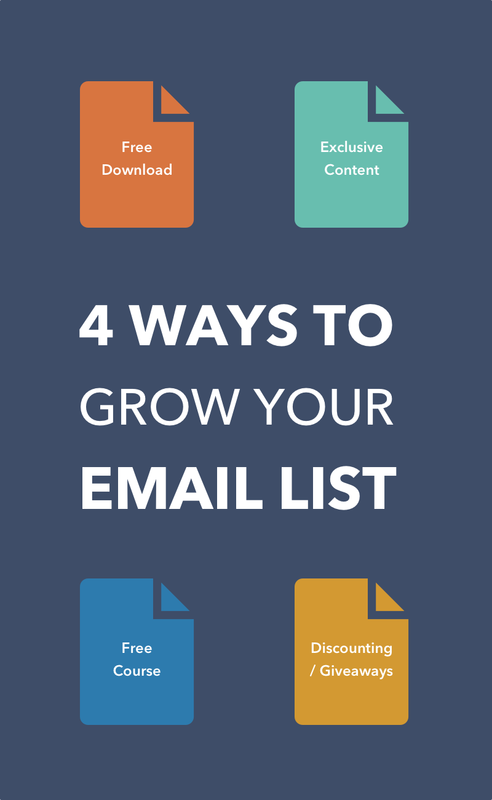 When you’re just starting out with email marketing, growing your list can feel so slow. If you’re also just starting out with your business in general – versus just adding email marketing to an existing platform, it can feel even slower! For example, when you do giveaways, this is especially important. During a giveaway or contest, you might grow your list like crazy. But you don’t need thousands of the wrong people on your list. That just increases your marketing expenses, lowers your metrics and stats, and frustrates you and your readers – especially the ones that don’t want to hear from you. Those are not your people! One of the best ways to grow your list is to offer something people actually want, in exchange for their email address. This is typically called a lead magnet or signup incentive. A lead magnet can be a freebie, a discount or any other incentive. Lead magnets can include things like an ebook, a template or guide, or a course etc. It’s something you offer readers in hopes that they will sign up (a lead!). They exchange their email address for whatever you’re offering, and you both hope that what follows is good for everyone! So you’ve signed up for an email marketing software (like MailChimp), and added a couple forms to your website. Now what? If you’ve been plugging away the last couple weeks or months, slowly growing your list at a snail pace, that is about to change. If you’re like most of my clients, you’re procrastinating on growing your list simply because you don’t know what to offer. That’s about to change. 1. Free Download – Ebook, worksheet, process, template, spreadsheet etc. We all love free stuff, don’t we? The key here is to make the freebie super useful to your readers and relevant to your website. Your goal here is to get them to sign up. So show them what you know about your area of expertise – your business or blog. There are a lot of different buzz words and fun things to call this. Here are some popular ones: worksheet, roadmap, blue print, guide, template etc. Word of warning: please offer something of value. So many times I see a “worksheet” that is simply 3-4 questions in a text doc exported as a pdf. Sometimes it’s nicely designed. Many times it’s very basic. It leaves you feeling like “really? I had to sign up for something to see this? Seriously?! Unsubscribe.” If you over sell and under deliver, you’ll probably see high unsubscribe rates. Remember, they’re going to judge your future work and products off of this. Don’t oversell it. If you over-deliver here, you’re setting a reputation for over-delivering. So if you offer things for sale, your readers are going to be more likely to value what that is versus thinking it might be crap too. A great place to start when trying to figure out what to offer is to hop into Google Analytics and see what your top 1-5 posts are. Is there anything you could create based around one of those topics? This would be called a “content upgrade.” What’s really cool about approaching it from this angle is you already have traffic coming to this page. So you’re not starting from scratch. If you were going to write a follow up post to your top trafficked page, what would it look like? Could you turn that into something your users could download? Why would anyone want to sign up for your newsletter beyond the freebie? Your signup area is also a good place to tell subscribers what to expect on a weekly or monthly basis. Maybe it’s a behind-the-scenes look at your business. Maybe you get a bit more personal about what you’re doing, or answer questions you get, or extra tips and tricks, favorite resources you’ve found or things you’re reading etc. This is a good place to remind them they won’t just be seeing a re-hash of the blog or what you’re doing on other social media channels. Maybe you even share business news, stuff you might not just write a blog post about. Remember not to share something you wouldn’t want out there though. Not ready for a full-blown email newsletter? You could use autoresponders to set up evergreen content that explains what you do, who you are, etc. And then just send out monthly or quarterly updates when you have something to say or a new product that is out etc. You could even do some light discounting. Discounting and giveaways are my least preferred method of growing a list. You can see quicker growth this route, but if done wrong you train your customers to expect discounts or grow a list of people who wanted your freebie instead of your business. However, in e-commerce offering a small incentive to tip the customer into buying now can be pretty effective. Try to be strategic when using promo codes or sales to grow your list. Think beyond just $x off or x% off, and consider other things that might add to the experience, without just tossing revenue away. Maybe you have a product that’s a higher perceived value, but that your margins are high on. You could offer a promo code for signups that gives that away for free with any order, or any order over $50 etc. Additionally, when you’re discounting, don’t forget to change things up. Offer something different each month and change your signup promo code and have a “expires x” date. This can also help add a sense of urgency and let your customers know you’re doing new stuff. The last thing you want is them to see the same offer every time they go to your website, that just cuts the price of your product down by $x because that’s the perceived normal value. I hope this helped you think of some ideas for getting started. Remember, my #1 take away for email marketing is: ADD VALUE. Don’t be noise. Be useful. Would you be excited to see what you’re sending? Great! Not so much? Then don’t send it! Want more? Check out Why You Should be Building an Email List, 7 MailChimp Hacks You Should Be Using, and Frequency: How Often Should You Send. What are your intentions and goals for creating content? How often should you be sharing? Will you use themes or holidays to tie your content together? How will you know if you’re getting results from your content? What does your 90 Day Plan look like? To get started with answering these seven content strategy questions, sign up for your free content plan lessons. The Content Plan Guide covers quick, actionable advice on how to use content to grow your business. 7 lessons, deliver to your inbox each day. Lesson #1 – What are your intentions and goals for creating content? How will content help your business or blog? Are you wanting newsletter signups, event registrations, downloads, shares, visits etc? Or some combination of the above? As with starting any new project, it’s important to know what your goals are and how you’ll measure them. A good content plan includes a look at who your audience or readers are? How to know where to focus your niche. This lesson is all about asking yourself what do you know and what do other people want to know? Plus tips and tools for SEO. How frequently can you commit to publishing? Monthly, weekly, weekdays, daily, 4x day etc.? Selecting a frequency helps you plan the rest of your marketing and your resources (such as as other team members, authors, guest posts etc.). Picking monthly themes (even if just internally) can help you not only think of post ideas, but also tie your content together in a cohesive way. You can use monthly or weekly topics, categories, or themes. Plus, consider how holidays impact your content schedule. It helps to keep an eye on current events and holidays when planning future posts, even if not every holiday affects your business. Now that you have a full list of themes, it’s time to brainstorm new content ideas. This includes whether you will you do any series type posts and tips and tools for coming up with content ideas. In the final lesson, we’ll map out your next 90 days of content and commit to consistent writing. After your plan is in place, you’ll check in on it to make adjustments. Need to lower frequency? Do it! Ditching a theme? That’s learning and progress! To get started, sign up for your free content plan lessons. Get the lessons and instant access to the 2017 Editorial Calendar Template. 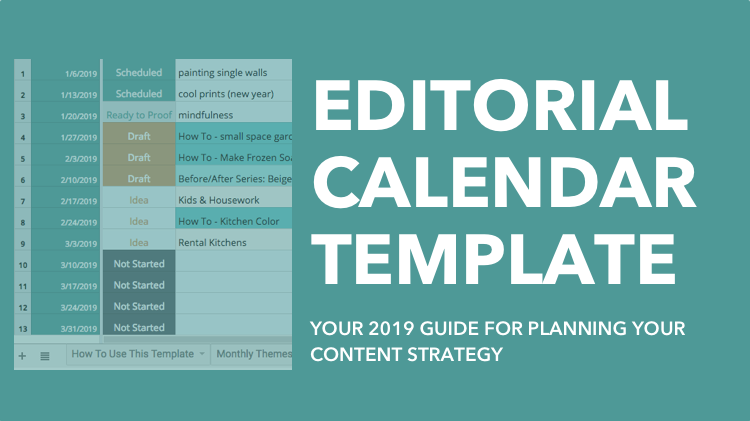 The purpose of this Editorial Calendar Template is to plan out your content for the year. With an editorial calendar template, you can keep track of post ideas, the status of posts, holidays, monthly themes, goals, and even how you plan to market your content. Get it now for $24. Do you need an email list? Likely, but maybe not… yet. Since I run an email marketing consultancy, you would guess that my answer to that question would be a resounding “YES!” It’s not always. Lately, everyone is talking about growing a list. I go to my local coffee shop and hear funny conversations about “growing my list” and “sending newsletter blasts”. 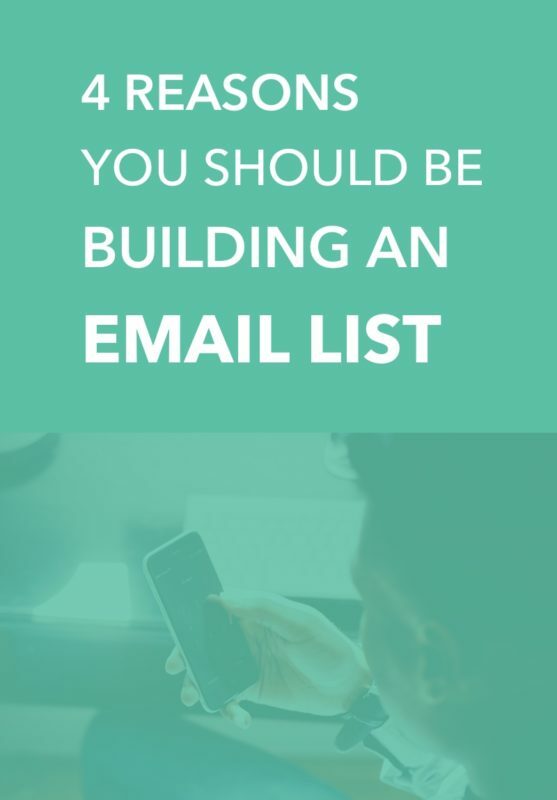 In this post I’m going to explain: Why Building an Email List Is a Good Idea, How to Know If You Should be Building a List Now… or Waiting, and How to Get Started. I get asked all the time about email lists. Everyone feels like an email newsletter is something they should be doing. Thanks especially to the marketing efforts of email marketing software (MailChimp, Infusionsoft, Aweber, Constant Contact etc. ), case studies, and pop business blog posts. They’re often not exactly sure why. But everyone wants to start one. It’s a classic case of the “shoulds“. Email has been around for ages. Businesses and bloggers often feel like they need to be doing a newsletter. Just like they’re doing social media, and blogging, and SEO, and conversion optimization… and whatever the latest thing they read about is. Here’s the deal, you don’t have to do any of those things. But there are a lot of great reasons to spend time on email marketing. #1. Email has the highest return of all marketing channels. The Return on Investment (ROI) on email marketing is huge. It usually leads all other channels. Depending on who you listen to (DMA has said from $40-44, over the years). That means for every $1 you spend on email marketing, you get $44 back. If you make money or plan to make money via your website an email list can help you do that. Whether you sell products or services or advertising, you need an email list. #2. Like blogging, email is a marketing channel you control. Unlike social media platforms, email is something you own. Over the years, individuals and businesses used social channels like Facebook to grow an audience. They were investing in a platform to communicate with fans. Yet, it was a platform they didn’t own. People get outraged as the rules change overnight. 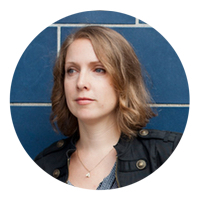 Yes, MailChimp (or whoever your software provider is) could change their pricing structure. Or Gmail might divert your newsletter to the promos tab, but you’re still there. With a newsletter, you’re not required to pay hundreds in ads just for your fans to see it, like Facebook. Social networks can be gone tomorrow (more likely that the advertising switch is just flipped “on”). Email marketing is the single biggest network that you can control to drive targeted traffic to your site. #3. Email is where your loyal legions are. Email subscribers are usually a large overlap with actual customers. They’ve invited you into their inbox! You need to treat them right, be VIP! And listen to them. Some of my clients say that email feels like a one-way communication. This can be true, especially when people start using the word “blast”. This makes me cringe. Please don’t “blast” your subscribers. These are your best people! They requested to hear from you. Think of it as communication – a give and take – not a blast. If you must use a war or sporting term, maybe try a tennis or other more gentle or playful sports analogy. Find ways to make it a back and forth conversation. Ask them to reply, insert a poll, talk about other community members, post a survey etc. #4. Email is part of your routine. Email is such an ingrained part of our routines, isn’t it? As much as you’re trying to get to inbox zero or go on a digital detox, you’re still pretty good at checking your email. If there’s something you’re interested in aren’t usually going to read it? If you’ve found people who want to hear from you, it can be one of the easiest ways to share what’s going on in your world. Launching a new service? Have a new seasonal product that you know will excite readers? Have big exciting news? Email them! While I tell most people to have an email list. I don’t advise everyone to do it RIGHT NOW. I’m not here to convince you either way, just give you the information to decide on your own. If you just blog on occasion – for fun, don’t plan to grow or sell anything in the future, and the idea sounds overwhelming. Do you sell something online – a service or product? Do you have your brand and offerings well clarified? Do you have a blog or some kind of content that you’re creating or curating already – on a blog, website, or social media channels? If not, are you willing to invest some time doing this as well? At the least, you will be writing in your newsletter. If you answer “Yes!” to the above questions, I would recommend you start building an email list. Just remember that email marketing takes time. You will spend time setting things up and designing and editing your templates. You will spend time writing and creating campaigns. You will spend time replying to people. You’ll spend time planning what you’re going to say, and reporting and analyzing what worked and what didn’t work. Email marketing is another marketing channel. Too often people don’t treat it like one. Don’t treat it as just an extension of your content or social media. While email marketing is connected to many parts of your business, it still requires time and planning. The next step is finding the time. You might not have the time for a newsletter list. Most people new to email marketing feel like they don’t have the time. I would recommend analyzing what you’re currently spending time on. There might be some things not getting you the results that an email list could. You may need to replace or outsource something, instead of adding more hours onto your weekly plate. Feel like you don’t have the time? Here’s an idea of the time it may take you. It will take you a few hours to set up your account and tinker around learning and changing settings. It will take you 2-5 hours per newsletter send. So 5 hours a month or 8-15 hours a month if you send on a weekly basis. It will take you a few hours here and there every time you want to learn something new. It takes time to learn things like A/B testing, planning out your content, or researching why you can’t get a template to look like you want it to. Feel like you don’t have the time for ongoing email marketing yet, but know you need to? Start collecting your list now, and then revisit this next quarter. Pro tip: There is a downside of collecting a list that you’re not yet sending to. If it’s a while before you can get to it, your list may be dormant. Your users may wonder who you are, and not be as excited to hear from you. You may get a lot of unsubscribes. So don’t leave it for too long. What are you hoping email marketing will help you do? Sign up for a free MailChimp account (free for the first 2,000 subscribers). Add a sign up form to your homepage and your end of blog post or sidebar. Consider a not-too-aggressive popup. WordPress offers plugins (many are free) that sync with MailChimp. To get started with the smallest steps, you don’t have to do a lot. Start with signup options. Add 2-3 places people can sign up. Don’t spend a ton of time customizing these yet. If you’re feeling ambitious, create a draft of your first newsletter campaign. Start small. Then, make an appointment with yourself to revisit this project in a month. That is when you can get excited about your strategy, what you have to offer or say, how often you’ll say it etc. Can’t wait to go started? Sign up to hear when my email marketing strategy book is ready.